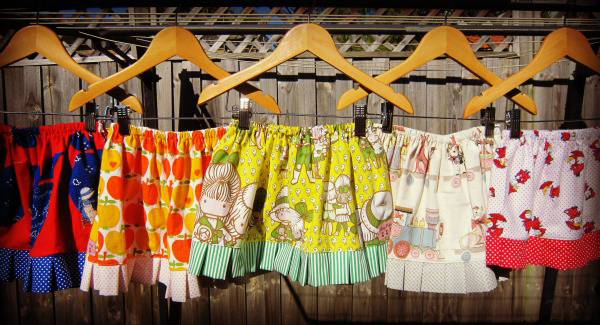 FK chats with Zoe from Sydney based classic & quirky children’s label Pretty Pickings! Tell us a bit about Pretty Pickings and what products we can expect to discover? 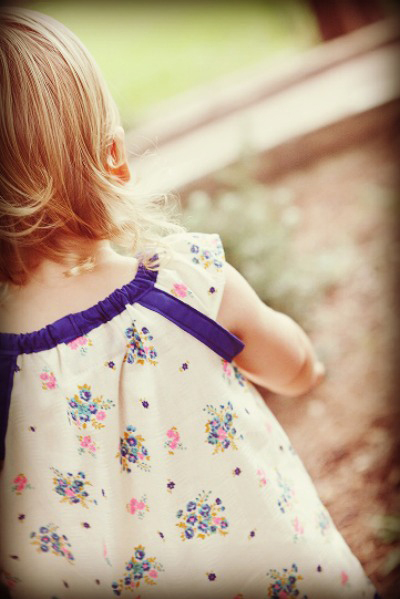 I have always been a huge fan of vintage clothing and fabrics, I also love to see children dressed as children! 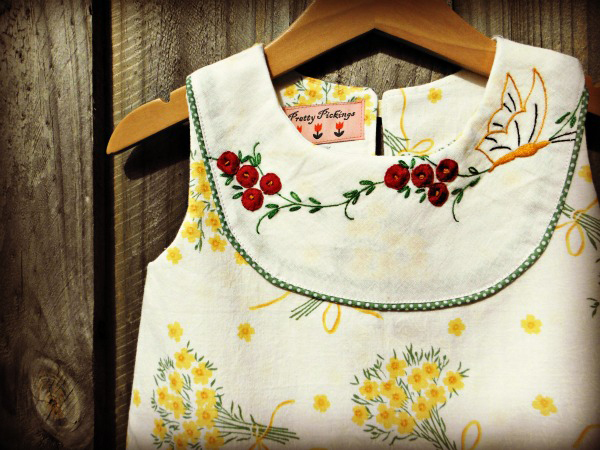 Pretty Pickings clothing uses a mix of vintage, upcycled and a small amount of new fabrics to create clothing that embrace children being children. Think classic, individual, cute, quirky and you are almost there… A lot of my items are one off so you won’t be seeing anyone else’s children running around in these pieces! With me at Finders Keepers this December I will have embroidered doily dresses, a huge range of vintage fabric dresses (It really is hard to decide with so much choice! ), pleated skirts, nappy covers, boys shorts and a new dress I made for the 6-10 yrs bracket who aren’t always catered for in the market scene I think. What is your background and how did you get started working with children’s clothing? 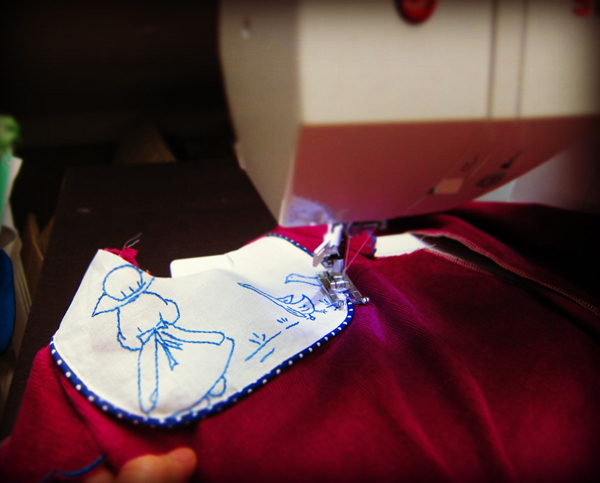 I’ve always been a sewer, my mum made stuff and so did my grandmother so it’s in the blood I guess – although my mum will love to tell you the story of how I ‘fired’ her from helping me out with the dresses! During uni years, I was always the friend who on a Saturday afternoon realised I had nothing to wear so I would whip up something – not perfect by any means but over the years I have gradually perfected my skills. When my daughter came along almost 6 years ago I started making things for her, they were liked by friends. At the time I was living in Newtown so I ventured into the local children’s store and they liked them too… the rest is history I guess! How has your creative style developed over time? and what inspires your work? 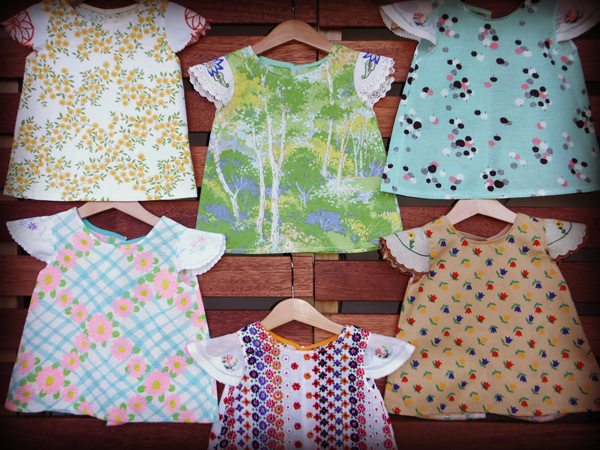 I started off with some pretty simple designs – in fact I sometimes cringe when someone (usually a friend) dresses their child in one of my old pieces. They still love them but all I can see is how much better my creations are now and how much more they embody Pretty Pickings ‘style’. I feel the past 5 years have seen my creative style develop in leaps and bounds. I now know what I like making, what I make best and what my customers want to see which makes us all happy! 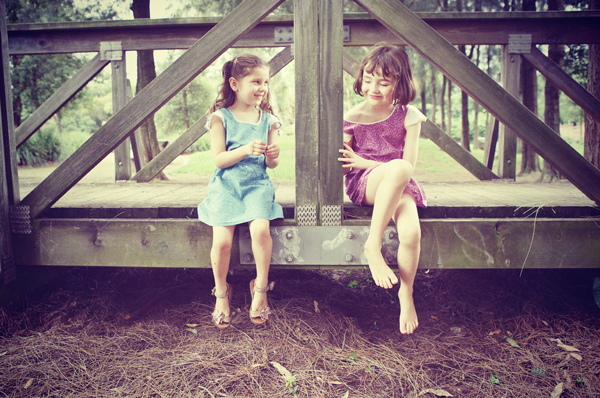 My work is inspired by styles of old – dresses I wore as a child in the late 70’s, early 80’s. It is also largely inspired by the fabric… I am all about the fabric and spend a great deal of time sourcing amazing vintage fabrics from all around the world. I love to sit down with a pile of fabrics, a pile of doilies (if you saw my collection you would gasp!) and work out the best combination of the two – that is the fun part! We live in Sydney’s Inner West and our house, although beautiful is reasonably small. The majority of the last 5 years had me sewing on the dining table and having to pack it away afterwards. About a year ago we made the best investment and got an attic storage room complete with an opening skylight for ventilation…24sqm of me space! I know have a space to sew and NOT pack away and it is GREAT! A friend asked me the other day if I always look at what children are wearing…and the answer is probably yes, especially when it is something a little different to the norm. Ultimately though, the fabric guides my creativity – I am constantly thinking of ways to showcase the beautiful fabrics I find in the best possible way. There have been some challenges… challenges like converting it from a hobby to a business or finding the time to create whilst looking after two young children. I also find it a little difficult to be constantly promoting the business – facebook, markets, media, agghhh! I love that I can be at home with my children but also have a creative vent that helps me to be me as well as a mum! Yes, she did fire me but I taught her to sew!! I am very very proud of the creations Zoe sews. Zoe’s mum, Giselle.